For more than sixty years, the Ojai Festival Women’s Committee has actively supported the Festival and its BRAVO Music Education and Community Program, providing both financial support and a vital volunteer base. Nearly 120 members strong, the Women’s Committee hosts regular social functions, fundraising events, and arts/music outings to Los Angeles and the surrounding areas. They organize and produce the annual Ojai Holiday Home Tour and Marketplace, a showcase of local homes adorned with festive inspirations for the holiday seasons, which is their biggest fundraiser of the year. Women’s Committee members also provide integral volunteer support for BRAVO’s Music Van and Instrument Petting Zoo, and during the Festival each June. The Women’s Committee is always looking for new members – to join, fill out the form below or download a membership application, email info@ojaifestival.org, or call 805 646 2094. For nearly sixty years, the Ojai Music Festival has been nurtured by a devoted group of supporters known as the Ojai Festival Women’s committee. Their innovative contributions have encouraged –indeed, sustained –the very existence of the Festival over the years. In the early 1960s, the Festival’s Board of Directors asked a group of community notables to help underwrite the appearance of artsts such as Aaron Copland, Igor Stravinsky, and the emerging Michael Tilson Thomas. Rising to the challenge, they established the Fift-Dollar Brigade in which each member pledged to earn (not give) fifty dollars as a contribution to the Festival. In those days, fifty dollars was the equivalent of a good week’s wages. They put their talents to work, cooking sewing, and lecturing their way to success. By 1954, the Women’s Committee had taken root and community leaders Connie Walsh, Margi Baker, and Marian Kelly worked diligently to establish a resale shop for elegant castoffs, one of the first of its kind in Ventura County. For the next forty years, the Festival Thrift Shop flourished, providing dependable funding for the Festival. Over the years, the Women’s Committee has grown into a mainstay of the Ojai volunteer community, enjoying great success with friendraising and fundraising. Whether it be opening their homes to musicians, baking up goodies, helping backstage, or organizing galas –no task has been too large or too small. 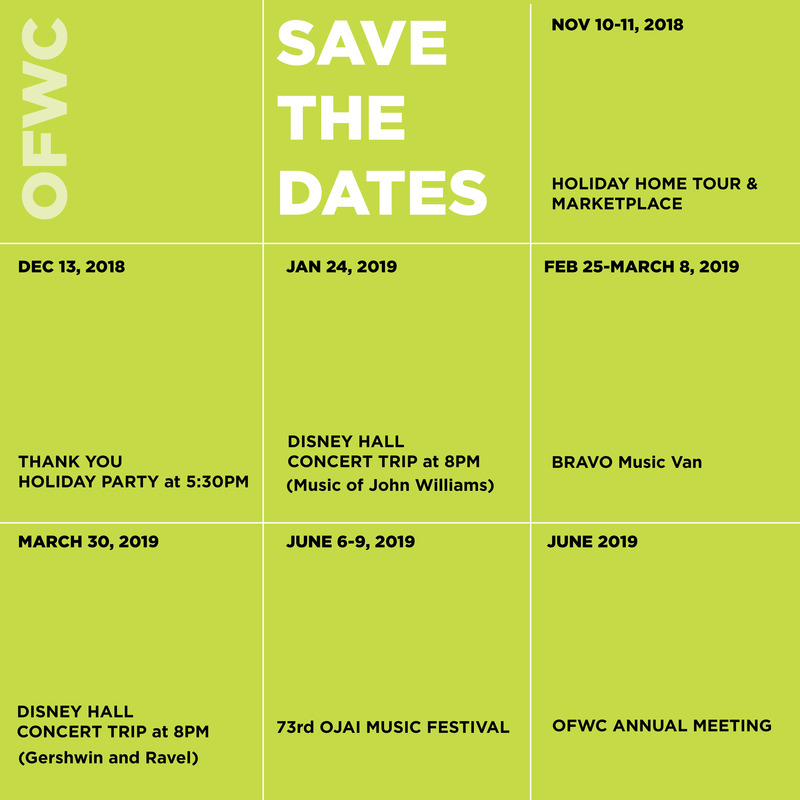 In 1996, the Women’s Committee inaugurated the annual Holiday Home Look-In under the initial guidance of Joan Kemper, Christine Drucker, and now former Ojai Music Festival executive director Jackie Saunders. Subsequently nurtured under the leadership of Peggy Russell and the participation of over a hundred docents each year, the tour is an exciting weekend in which Ojai’s most beautiful homes are opened to the public as a fundraiser for the Festival and its education programs. The Women’s Committee founded and continues to significantly support the Festival’s music education program BRAVO. It has grown into an award-winning program that brings music to Ojai elementary school children. These committed, inventive women have imbued the Ojai Music Festival with their spirit, strength, grace and fundraising talents. Over a hundred members strong, they look forward to sharing their gifts to further the tradition of bringing beautiful music to the world through their beloved Ojai Music Festival. Join us as a Women’s Committee member!